Lee Kohler is a 5th generation dairy farmer from Fairfield County, Ohio. Together with his son Jeremy and family, they care for 80 Guernsey and Holstein cows and farm 350 acres of crops at Marodore Farm. The Kohlers are proud to work as a team to produce safe, wholesome milk and provide excellent care to their cows. How did you get into dairy farming? Lee: : My dad bought our first registered Guernsey cow in 1938. My parents’ names were Mary and Theodore, so they smashed them together to make Marodore Farm. I was raised in this lifestyle and so was Jeremy. I worked in agribusiness for 6 years before I came back to the family farm, and I guess I always had a yearning that I wanted to come back. I enjoy working with the cows, and I like to believe we’re making a difference by providing a high quality, nutritious product. I think Jeremy wanted to come back to the farm the day after high school, but I thought he needed to expand his horizons first. Jeremy: I went to Ohio State ATI for two years for dairy science and then finished up my bachelor’s degree in animal sciences at Ohio State. After graduation I worked off the farm for about five years and then came back to our farm. I’ve always known that’s what I wanted to do. What’s it like farming with your family? Lee: Most days it’s the best. That was one of the main reasons I wanted to come back to the farm. When I was working in agribusiness I was on the road a lot, and part of the reason I wanted to come back to the farm was to be more involved with my family. The fact that Jeremy wanted to come back to the farm really made it even more special. Hannah (Jeremy’s wife): I wasn’t raised on a farm, so I learn something new every day. I’m not around as much as Lee and Jeremy are because I’m at home with the kids more, but I know the kids love coming to help at the barn and I love sending them. They love it and that makes me love it. It’s a lot of work, but I know they take a lot of pride in it. 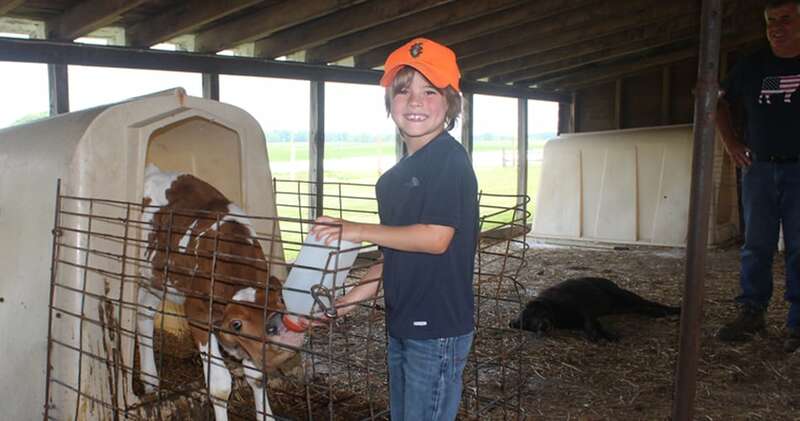 Silas (age 7): I like when I get to feed the calves and I’ve put the milker on the cows a couple times. Why did you choose Guernseys? Lee: I was raised with all Guernseys, so I have a special place in my heart for them. My guess is that has transitioned into all six of my kids, because they have the same appreciation for them I think. The Guernsey community is small, so it’s almost like an extended family. My kids will tell you that some of their best friends are Guernsey breeders that they’ve met across the state or the nation. What do you want people to know about dairy farming? Lee: We really work hard to try to produce a quality product and represent the industry in the right manner. This is something my children and grandchildren participate in – they care for the cows and drink the product too, so we want to make sure that it’s safe for them and everybody.